In South Florida we are blessed with the ability to grow food all year long. Gardeners are able to shift their focus from planting cool weather veggies and herbs in fall, winter, and early spring to planting tropical edible plants in our late spring and summer. Our late spring and summer is very rainy, hot and humid. It is a time when most cool weather greens and herbs don’t grow very well, if at all, but gardening can still go on. 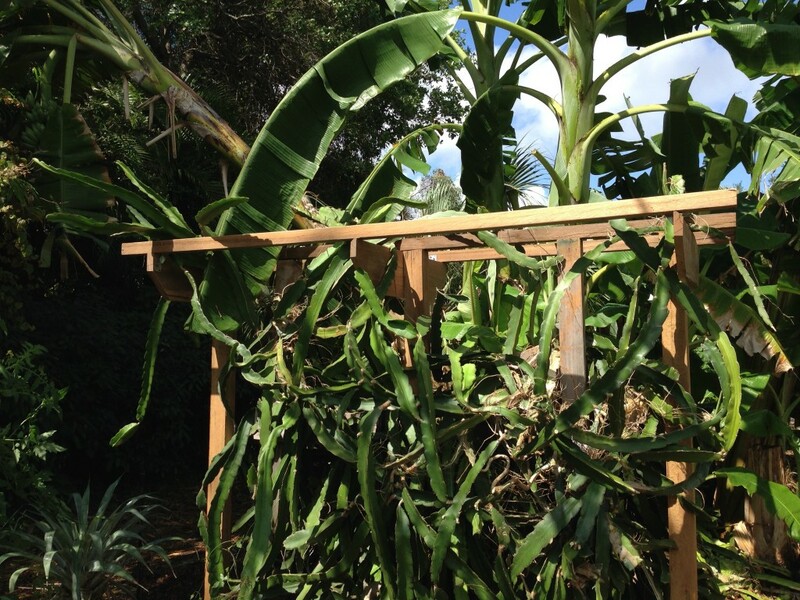 South Florida is one of the few places in the U.S. where tropical plants thrive. 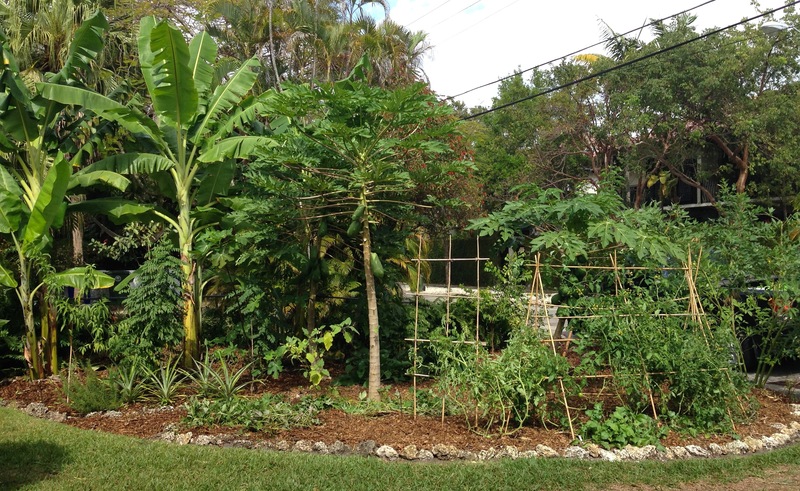 Food forests are a way of gardening which allow tropical plants (mostly edible ones) to coexist in a garden design that is closer to nature than traditional edible gardens. In nature there are many ecosystems, and many are found in forests. Forests have plants of many shapes and sizes. There are also microclimates within forests which can favor or disfavor species through variations, of sun, wind, temperature, and moisture. Food forests have plants of many shapes and sizes too. Big trees, small trees, bushes, climbing vines, sprawling ground covers, exist in food forests but mostly as edible fruit, vegetable and herb plants. There are also plants that are edible to insects and other wildlife as well as plants that feed the web of life in the soil. Food forests are food-producing systems that generally require less maintenance, mostly due to the fact that most of the plants are perennial and don’t need to be replanted every year as you find in annual veggie/herb gardens. Also as food forests mature, they shade the ground more so there is little weeding and less of a need for irrigation. 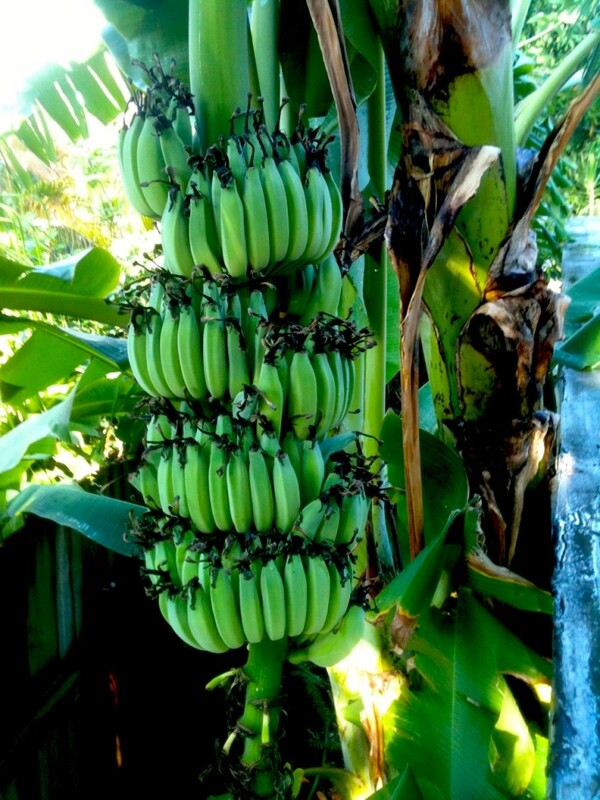 For those of you that are interested in starting your own food forest in South Florida, I recommend learning about different tropical fruits if you don’t already know. My favorites are banana, papaya, passion fruit, mango, avocado, lychees, star fruit, star apple, custard apple, white sapote, black sapote, guava and mulberry. Citrus are prone to getting problems with citrus greening, so I recommend not planting citrus, or at least not a lot. Once you know which tropical fruit trees you want to plant, it is time to lay them out. The tallest-growing fruit trees should be positioned to the north of the space, and the lower plants toward the south end. Vines should be planted along fences, arbors, or trees that can be used as a trellis. Next, there should be thought into what gets planted in the spaces in between. 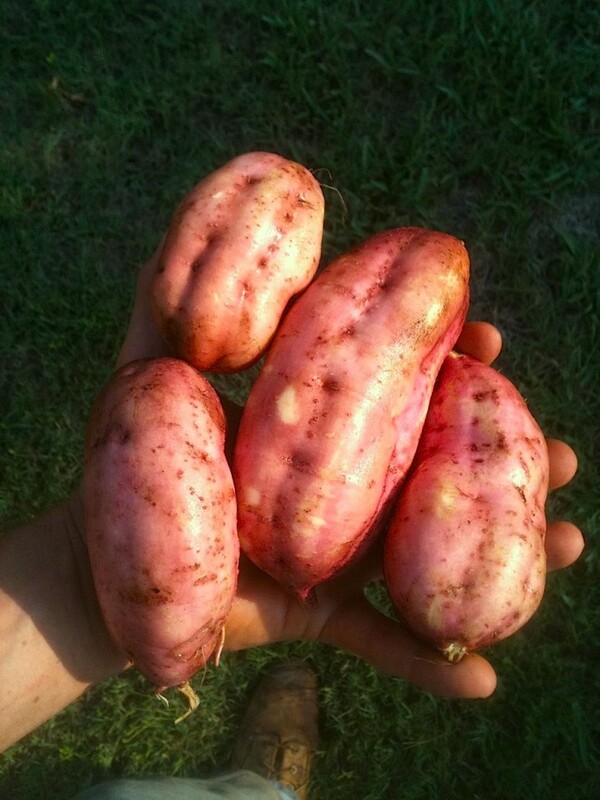 I really like sweet potato as ground cover in the sunnier parts of the food forest, tropical spinaches/greens in the shadier areas, and nitrogen-fixing cover crops in areas that are marginal or with soil that need improvement. Food forests are often larger in area than annual gardens. Mulching becomes very important as a way to control weeds and build the fertility of the soil. Pruning, harvesting and mulching is the main work required in maintaining food forests. Limestone rocks and logs can be used to define paths and planting beds. If you want an automatic watering system for your food forest, sprinklers on tall risers are the way to go, as they don’t get in the way as much and can cover large distances. Once established, food forests become very productive and are a wonderful addition to the landscape. This entry was posted in Edible Garden News and tagged compost in Miami, Dylan terry Miami, Dylan terry ready to grow, edible gardens florida, edible landscaping, Edible perennials, edible school gardens, florida edible landscaping, florida edible plants, food forest, Garden to table, Gardening raised bed, Grow vegetables, growing bananas in south florida, Growing herbs in Miami, Growing herbs in south florida, growing vegetables, Growing vegetables in South Florida, Heat tolerant vegetables, herb plants, Hot weather edible gardens, how to grow an edible garden in south florida, irrigation for gardens, low maintenance florida garden fruits vegetables, Miami Permaculture, miamiediblegardens.com, organic garden, Organic garden company south florida, Organic gardens Miami, organic vegetable maintenance florida, Permaculture for south florida, Raised Bed Gardens Miami, Raised beds Miami, ready to grow gardens, Ready-to-Grow Gardens Miami, Slow Food Miami, south florida edible landscaping, south florida edible plants, South Florida herbs, south florida raised bed gardens, tropical fruit trees, vegetable garden, Vegetable plants in Miami. 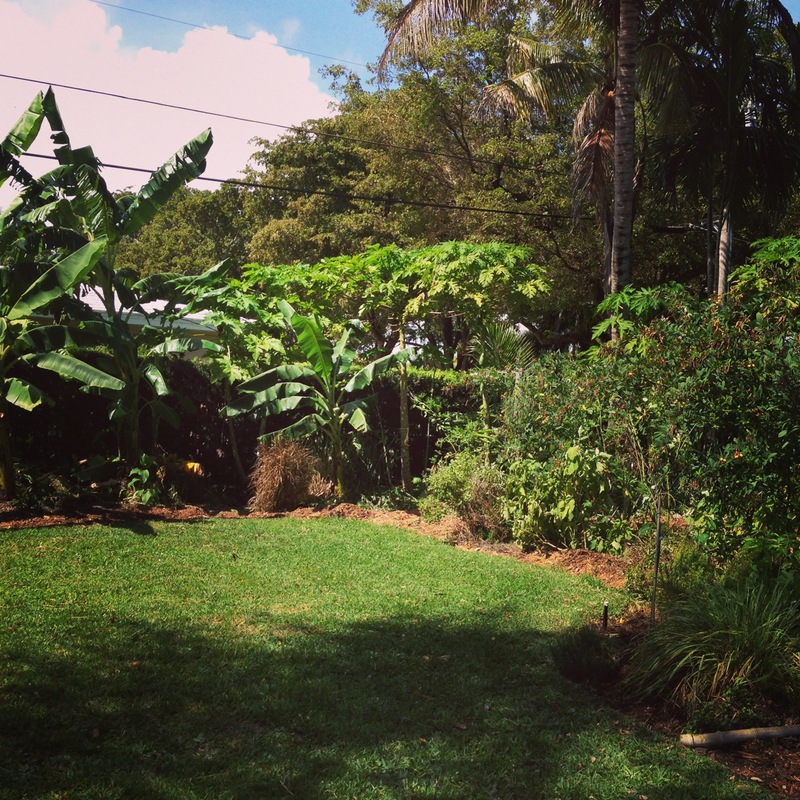 edible plants in south florida, Veggie garden, where can i get compost in Miami. Bookmark the permalink.